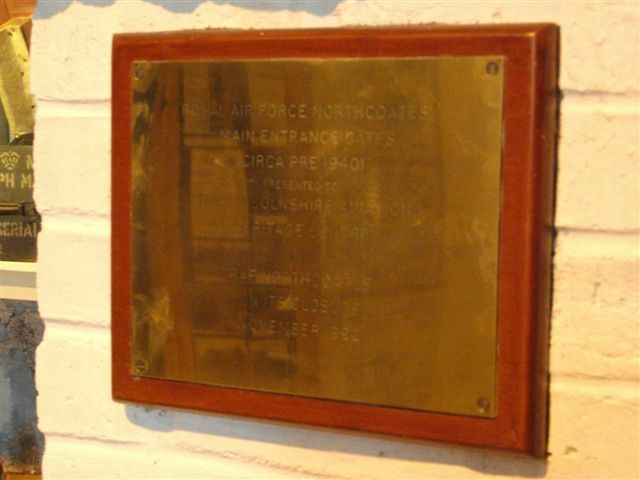 RAF North Coates (near North Cotes village, Lincolnshire) was initially opened as a military airfield during WW1. It was later reopened during the inter-war period. The airfield remained open until November 1990. As with some other UK wartime airfields there was a slight discrepancy in the spelling, apparently to confuse the enemy as to its exact location! The British Prime Minister Winston Churchill visited the airfield in 1940. Evidently, Mr Churchill knew where all his RAF stations were located. During the Second World War, the airfield was relatively small in comparison to some other Lincolnshire aifields. However, because of its location on the east coast of Lincolnshire, the airfield had a certain strategic importance. After the closure of the airfield in 1990 some items to commemorate the role of the station during the war were donated to the Lincolnshire Aviation Heritage Centre at RAF East Kirkby. This includes the information boards about the list of wartime Commanding Officers. Staff based at the airfield during the war came from all over the Commonwealth. The airfield's casualties included some of the Commonwealth and American airmen, whose graves can be found in the Churchyard of St Nicholas in the nearby village of North Cotes. There are 31 Allied casualties of WW2 buried in St Nicholas' Churchyard, North Cotes, plus one from WW1. Additionally, there are graves of 3 German service casualties, 1 civilian casualty, plus a small number of inter-war and post-war service casualties. The Commonwealth War Graves Commission owns the plot where the graves are located and it is maintained to the same high standard as any of the Commission's cemeteries in the main areas of conflict of WW1 and WW2. Son of Ralph Raymond and Ethel Maud Andrews, of Eaton Bray, Bedfordshire; husband of Ruby Joyce Andrews. Son of Henry and Nancie Bell, of Falkirk, Stirlingshire. Son of Alfred and Mary Elizabeth Bingley; husband of Beryl Corrinne Bingley, of Edmonton, Alberta, Canada. Son of Arthur and Emma Bourassa, of Trois Rivieres, Province of Quebec, Canada. Son of Dave and Anna Brodsky Buckolz; nephew of Frank K. Brodsky, of Rapid City, South Dakota, U.S.A. Son of Percy and Dorothy Alice Phillippa Cowan, of Brighton, Victoria, Australia. Son of Roland George William and Ellen Mary Dann, of Portage la Prairie, Manitoba, Canada. Son of Joseph and Ruth Read Ennis, of Toronto, Ontario, Canada. Son of Albert Henry and Ada Lucy Elisabeth Friend, of Victoria, London. Son of Frank and Matilda Gaillard, of Banstead, Surrey. A.M.I.Mech. E.
Son of Frank and Clara Gaudet, of Rainy River, Ontario, Canada. Son of George Casillis Goulding, and of May Beatrice Goulding, of Vancouver, British Columbia, Canada. Son of Frederick Thompson Groome and Katie Maud Groome; stepson of Catherine Mary Groome, of Fareham, Hampshire. Son of John James Harris and Luella Harris, of Rosetown, Saskatchewan, Canada. Son of Frederick Thomas Harvey Herbert and Florence Amelia Herbert, of Corryong, Victoria, Australia. Son of Alexander Hay Heron and Margaret Heron; husband of Doris Clara Heron, of Ilford, Essex. Son of Harold Vincent and Gladys Muriel Hoskins, of Wollstonecraft, New South Wales, Australia. Son of George Alfred and May How; husband of Violet How, of Chingford, Essex. Son of Hector Murray McLean and Mary McLean; husband of Helen Lavinia Freda McLean, of City of London. Son of Edward and Margaret Neary, of St. John's, Newfoundland. Son of Arthur Joseph and Margaret Payne, of Stoborough, Dorsetshire. Son of Hector Henry Archimede Renai and Susannah Jane Renai, of Khandallah, Wellington, New Zealand. Son of Isaac and Johanna Rutherford; husband of Madge Marie Rutherford, of Bentley Heath, Warwickshire. Sub-Lieutenant (A) R.M. Andrews, Sub-Lieutenant (A) J. Gaillard and Lieutenant D. Groome - all Royal Navy, H.M.S. Peregrine, Fleet Air Arm 812 Squadron (Daedalus) were killed as the result of an air crash. Flight Sergeant (Pilot) A.W. Goulding, Sergeant (Pilot) W.J.T. Flagg, Sergeant (Wireless Operator / Gunner) R.G.E. Whale and Flight Sergeant (Air Observer) J.C. Harris - all R.C.A.F. 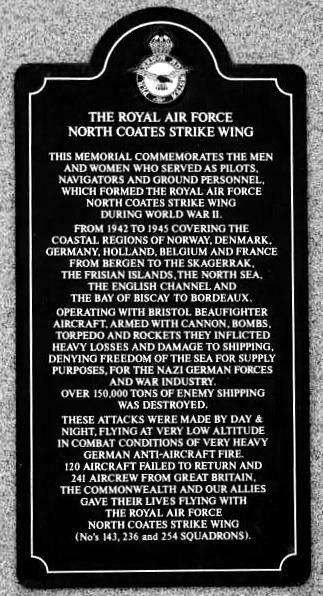 (407 Squadron) - were killed when their Beaufighter blew up and crashed. Although outside the usual scope of this WW2 forum, as there are only a small number of other service casualties interred in the CWGC plot at North Cotes Churchyard, the details of these are listed below. [As previously mentioned above the CWGC also maintains 1 civilian grave in the churchyard]. The North Cotes CWGC Plot is maintained by the regional office at Leamington Spa. The following summary about the country of origin of the 40 CWGC casualties in the North Cotes Churchyard is based on information kindly supplied by the Commission. It is relatively simple to see from the above statistics the global effects of a World War. Most of the CWGC casualties buried at North Cotes came from distant lands. This Memorial commemorates the men and women who served as pilots, navigators and ground personnel which formed the Royal Air Force North Coates Strike Wing during the Second World War. From 1942 to 1945 covering the coastal regions of Norway, Denmark, Germany, Holland, Belgium and France. From Bergen to the Skagerrak, the Frisian Islands, the North Sea, the English Channel and the Bay of Biscay to Bordeaux. Operating with Bristol Beaufighter Aircraft, armed with cannon, bombs, torpedo and rockets they inflicted heavy losses and damage to shipping, denying freedom of the sea for supply purposes for the Nazi German Forces and war industry. Over 150,000 tons of enemy shipping was destroyed. These attacks were made by day and night, flying at very low altitude in combat conditions of very heavy German anti-aircraft fire. The aircraft and aircrew lost at RAF North Coates between 1942 and 1945 is a good indicator of the manpower and munitions losses of a World War. Many of the North Coates based aircrew who died during the war perished in the sea and have no identifiable grave. Their grave, like those of many Royal Navy and Merchant Navy seamen, is in the ocean deep. The site of what became RAF North Coates is situated close to the southern side of the Humber estuary, close to the sea bank of North Cotes Fitties. During the First World War some parts of eastern and southern Britain experienced bombing raids from German Zeppelins. Consequently, in 1916 the first North Coates camp was established in as part of the defence of the Humber and the important docks of Immingham, Grimsby and Hull. The first squadron based at North Coates in 1916 was 33 (ND) when it was known as the Royal Flying Corps. There is one casualty buried in the CWGC plot at St Nicholas’ Churchyard, North Cotes from this time. 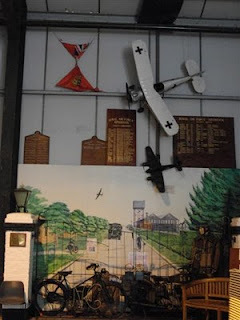 33 Squadron remained there until enemy raids ceased in late 1918. During 1918 the site was enlarged and re-designated a ‘Flight Station’, becoming the home of 404 Flight, 248 Squadron. 404 Flight transferred to North Coates from Killingholme and was re-equipped with DH6’s. These were used for anti-submarine activity and convoy patrols. Towards the end of the First World War, in November 1918, several other Coastal Land Flights relocated from Killingholme, remaining there until they were disbanded in June 1919. Between 1919 and 1927 the land reverted to agricultural use. In 1927 the Air Ministry purchased the land on behalf of the Government, initially to use for annual summer practice camps. However, with the rise of Adolph Hitler and the Nazis in Germany the camp again became part of the defence of the Humber. The strategic importance of RAF North Coates in the ‘Spitfire summer’ of 1940 can perhaps be seen by the fact that it was one of the places visited by British Prime Minister on 7 August while visiting Lincolnshire’s coastal defences. The Imperial War Museum has photographs of Mr Churchill’s visit in its archives. The following day, 8 August 1940, the Duke of Kent – then a serving officer in the RAF also visited RAF North Coates and the Lincolnshire coastal defences. Lincolnshire may have been a little further away from enemy-held territory than Kent or the south coast. Nevertheless, the Lincolnshire coastline was still on the front line in the Battle of Britain. 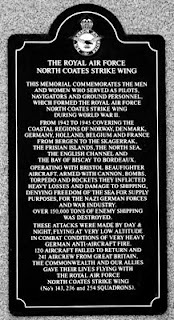 RAF North Coates played its part in the home defence during this battle, one that would ultimately lead on to the final outcome of the war being one of victory for the Allies. Arthur William Goulding's DFC and other medals are currently being auctioned on ebay. Sad.